The Nationals are only 9 years old as a franchise in Washington, D.C. but they seem to firmly established themselves as part of the community. In walking around the stadium, I found the fan base to be much younger than that of most teams. Some fans said that the older generations of baseball fans who live in the D.C. area have maintained their allegiances to other nearby MLB teams, specifically the Orioles. Architecturally, Nationals Park has rejected much of the retro ballpark movement I mentioned in my Baltimore Orioles post. This stadium incorporates much more glass and concrete than those designed in the retro style. The Nationals annihilated the Cubs 13-0. After the game, I heard a police officer refer to the result as a "football score." There can be up to 25 games of bags going on at once across the street from the stadium at Fairgrounds, an area constructed with old shipping containers that's open before and after Nationals games. 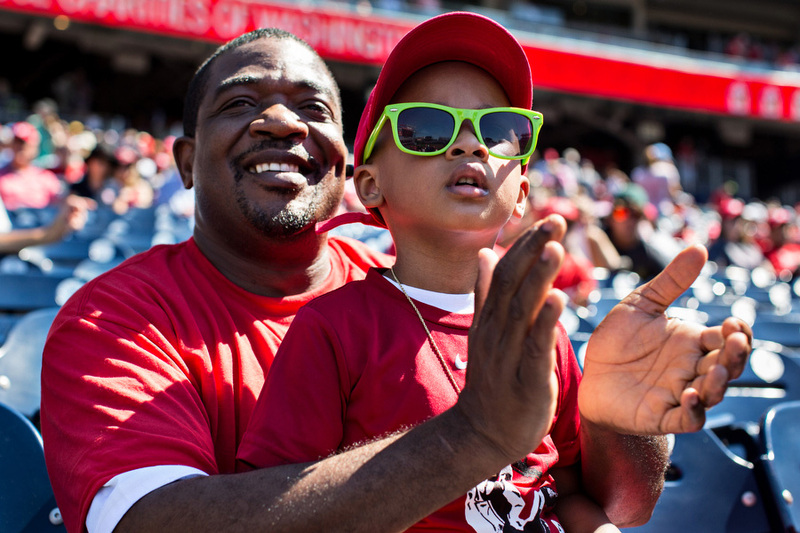 Seymour Clarke took his 3-year-old son Shemari to his first game. Tara Harmeson teaches sixth grade math and has been a vendor for five years. Nationals first baseman Adam LaRoche throws a ball into the stands. James "Jimmy O" Williams is an assistant coach for Prince George's Community College and a former professional baseball player. He played in the Orioles, Dodgers and Giants organizations, getting a major league contract from the Giants in 1973. During the summer, he coaches the DC Grays, a team in the Cal Ripken Collegiate Baseball League. Nationals pitcher Gio Gonzalez throws a pitch. The presidential mascot race got feisty.